This was a very sweet one. That’s the path, however you cannot add a folder path to the dock. You can drag it over to the space to the right of the separator bar (far right, near the Trash icon), however you can’t put it in the main dock. I don’t see the advantage of cluttering up the dock even more. You are going to end up using Finder anyway, so just add iCloud to the finder sidebar. Go to Finder preferences and tick off the iCloud item, then you will have it there whenever you want it. Im using high Sierra, this doesn’t work here. However, if you do want access to iCloud drive from the dock – type “iCloud drive.app” in finder from the top menu bar. 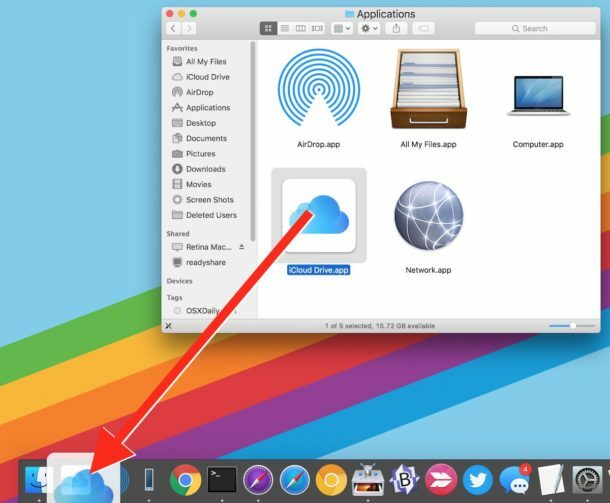 this will find the app, simply drag this to the dock. Good tip, and i find using this form the dock useful.. I have a lot of mailbox files where I keep favorite emails. I put them on the icloud drive but I continue to add new emails to these files in mail. How can I keep the files on the icloud drive updated as I add new files on my mail app?